This week I am giving away Kenneth E. Bailey's Paul Through Mediterranean Eyes: Critical Studies in 1 Corinthians (IVP, 2011). I will extend this giveaway until Monday, November 12th at 8:00 am EST. That is an extra day more than usual. So tell your friends, your family those who love books to enter their name below for a chance to win this book. Remember, once the winner is announced she/he has five days to claim the prize or it goes back on the shelf. Pete Enns has a good post on the problem with inerrancy. Here are a couple of quotes from his post Inerrancy: I think someone forgot to tell the Bible. Speaking as a biblical scholar, inerrancy is a high-maintenance doctrine. It takes much energy to “hold on to” and produces much cognitive dissonance. I am hardly alone. Over the last twenty years or so, I have crossed paths with more than a few biblical scholars with evangelical roots, even teaching in inerrantist schools, who nervously tread delicate paths re-defining, nuancing, and adjusting their definition of inerrancy to accommodate the complicating factors that greet us at every turn in the historical study of Scripture. Recurring dissent from within is a clear indication that inerrancy’s problems will not go away and that it may be high time that a deliberate move be made to bring those discussions openly into the evangelical mainstream, and so to promote an evangelical culture where such critical self-assessment is promoted rather than marginalized or ostracized. There are a lot of blogs you can read, but not all are worthy of your time. Here is a new one written by friend and colleague in New Testament studies, Sam Tsang. Like myself, Sam has done work on Paul and slavery and has a heart for both the church and the academy. His blog is Engaging Scripture and am I sure you will be challenged as you read it. Update: It appears Sam has started two blogs. his other blog is a preaching blog at Engaging the Pew. Here is another one for the "You can't make this stuff up" file. NEWBURGH, N.Y. (AP) — A trial has been scheduled for early next year in the lawsuit filed against an upstate New York church by a man whose leg had to be amputated after a 600-pound crucifix fell on him. Attorney Kevin Kitson of White Plains tells The Associated Press that the case of his client, David Jimenez (hih-MAN'-ez ), is scheduled for trial in January in an Orange County court. Kitson says Jimenez prayed to the crucifix outside St. Patrick's Church in Newburgh after his wife was diagnosed with ovarian cancer. When she recovered, he showed his thanks by volunteering to clean the cross. In May 2010, the crucifix fell on him, crushing his right leg. It was later amputated. 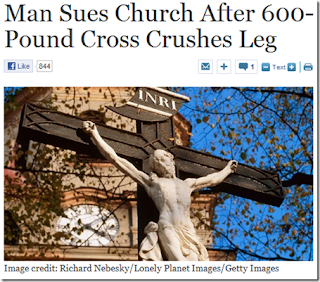 He's suing the church for $3 million. The church says it's not liable for the accident. No word on whether Jesus was on the cross that crushed the man. I suspect not, otherwise Jesus might be held for assault and battery. Today I look at 2 Thessalonians 2:15 and what Paul has to say about tradition. So then, brothers and sisters, stand firm and hold fast to the traditions we passed on to you, whether by word of mouth or by letter. 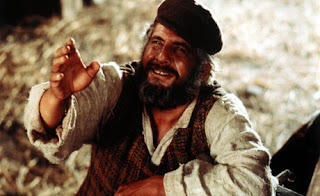 In the opening scene of Fiddler on the Roof the central character, Tevye, describes to the audience how Jews in the Russian village of Anatevka have kept their balance while living in a place dangerous for Jews. He explains it in one word, tradition. They have traditions for how they sleep, how they eat, how they work, even how they wear cloths. But what he can’t explain is how the various traditions got started. He doesn't know. But explaining the origin of the traditions is not what is important to Tevye and the others. More important is what the traditions do. And what they do is remind everyone of who they are and what God expects them to do. Unlike Tevye, Christians are not always fond of traditions. We are sometimes suspicious of tradition if its purpose, much less its origin, cannot be explained. People may participate in a certain practice or ritual for years and then one day ask why do we do it this way? If they are not satisfied with the answer they may end up rejecting the tradition in favor of another practice or none at all. But sometimes a tradition can be like a tool that only gets used once in a while. It sits in a draw, seems to take up space and you may even contemplate getting rid of if now and then. But then one day you need it and you remember why you have held on to it after all these years. I remember once sitting in a seminar in Cambridge, England when a graduate student asked the professor why the seminar was run in a particular way and wouldn’t it be better to try a different format. The professor responded: “This is Cambridge and we have been doing it this way for more than 800 years.” The professor’s answer explains why they do it that way, even if it doesn’t explain what it means. But it also shows that we don’t simply get rid of a practice simply because it is not “new” or even because we have forgotten what it means. Sometimes we hold onto those traditions because it is what helps keep us anchored to the past and who we are. Traditions are important for Christianity since they represent a link back to the teachings of the apostles and Jesus. The practice of communion and the Lord’s Prayer, for instance, are teachings encapsulated in ritual. When properly employed they remind us of who we are and what God expects us to do.This is one reason for the creeds of the early church. Creeds put into words the experiences of the believing community and summarize the basic ideas and practices that make one Christian. When recited they remind us what the church has taught throughout history. When Paul talks about “traditions” he is referring to those things that are commonly agreed upon by the church and have been inherited from the teachings of Jesus and the apostles. These traditions are not something that were invented or lack meaning, but are the very foundation Christian life and faith. In his letter here the “traditions” Paul refers to are things the Thessalonians were taught. Although he doesn't tell us what these teachings were, we do know their function. They were to be used combat the erroneous teachings that were circulating in the community. The Thessalonians had become “alarmed” and “unsettled.” The way that Paul combated the situation was not with new information or creating new practices, but reminding them of what had already been passed on to them. He told them to hold fast to their traditions. Every year I meet with students who want to earn a PhD. in biblical studies. By the time we are done with our 30 minute meeting I have talked most of them out the idea. It's not that I don't like my job. But the reality is that you will invest a lot of time and money to earn the degree and there is no guarantee you will get a job. There are a lot of people out there with a PhD who have never been able to find a job. (See my post from last year Thoughts on Applying for a PhD in Biblical and Theological Studies). Confirming the rather bleak news about the job market is a recent study by the Society of Biblical Literature and the American Academy of Religion. These are the two premier organizations in the field and if you are looking for a job chances are you will find it advertised on their web sites. The study is of jobs that were advertised over the last ten years. It shows that more and more positions are non-tenure track, require the ability to teach on a variety of topics, and usually require experience. In other words, there seems to be less hiring of "freshly minted" PhD's and more shifting around of those who are already working. A few more interesting points: Islamic studies is on the rise. New Testament and Early Christianity is hiring more than Hebrew Bible/ Old Testament. And if you are thinking about a job in a public institution your options are even fewer. Also, you might consider theology rather than biblical studies if you want a job. It's not all bad news and at the moment the guild, along with the rest of higher education, is in flux. But if you are thinking about a career in this field, you should know the facts. Below are the first ten points of the report. You can read the whole report here. 1. The decade under consideration experienced significant fluctuation in the number of job advertisements. Sharp decline marked 2008 to 2009 (-45.8%) and ad numbers in 2010 were just below ad levels for 2001 (494 and 511 respectively). 2. In 2008 81.6% of positions listed were tenure track, but this figure decreased to 51.1% in 2009 and 61.0% in 2010. These findings may indicate that the job market for the 2009 academic year fundamentally changed, not only declining but reconfiguring with a greater emphasis on non-tenure-track employment. 3. Hiring for new positions and vacancies, as opposed to sabbatical and visiting position hires and cases in which a search was reopened, accounted for 85.1% of position listings. 4. For ads posted with SBL and AAR from 2001 through 2010, the three most important skills or experiences desired or required by employers were (in order) holding a Ph.D., prior teaching experience, and interdisciplinary teaching or research. 5. Data may suggest that demand for Ph.D. and M.A. instruction has increased with little correlative effect on the demand for B.A., M.Div., and Th.D. or D.Min. instruction. 6. Jobs posted with the organizations were almost exclusively full-time rather than part-time. Christianity—accounted for 29.0% of ads. Positions in theology, philosophy, philosophy of religion, and ethics accounted for 21.9% of ads. 8. Positions in Islam were the major driver for the growth of positions dealing with modern religions and their histories between 2008 and 2009, increasing fourfold and accounting for 32.9% of such positions in that period. 9. New Testament and early Christianity positions drove the rebound for positions focused on biblical studies, accounting for 39.5% of such positions in 2010. 10. Positions in theology have led growth among positions in theology, philosophy, philosophy of religion, and ethics, doubling from 2008 to 2010 and accounting for 61.0% of such positions in that period. One of my students directed me to this video. It is a historical overview mixed with humor. Not bad for a Monday morning.